It’s exactly the same graphic as before, but with two decimal places. While my 8th grade Chemistry teacher may be glad that they are using more significant digits, I honestly don’t care. They were there before, just not displayed. Lame. This histogram leaves tons of open questions. 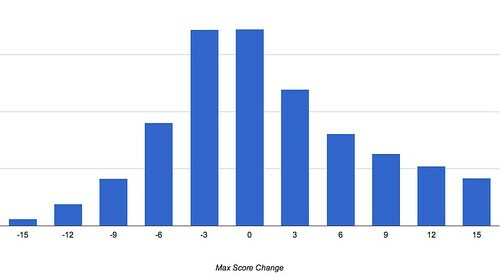 Is this different than your normal daily shift in scores? The histogram reminds me of a t-distribution with a fatter positive tail. If more people are signing up for Klout than are leaving, thats probably what it should look like anyways as users hookup more networks and gradually become more active online. The graphic doesn’t show that your score is any better, just that it changed. That’s not impressive at all. My beef with Klout remains simply that the service provides us with no real validation or explanation of our scores. They don’t show us how many times we have been RT’ed, mentioned, etc. On Google, you can look up your page rank, on app stores you can see your average rating and number of ratings, on Klout, you are told that your true reach has increased, but not told what that implies or how you can verify it. Klout is still the social influence measurement leader, but with Peerindex rapidly improving (and better in many ways in my opinion), and new competitors such as Proskore and Kred popping up, Klout should be worried. I’ll have a review of both Proskore and Kred up shortly as well so you can easily compare them for yourself. After taking a few weeks off from reaming Klout, their newest “improvements” have left me with no choice but to write a sardonic and snarky response. Klout has added 5 new services (Instagram, Flickr, tumblr, Last.fm, and Blogger) and removed ANY secondary statistics from our profile pages. I’m still not sure which is worse, just that both are stupid. I’ll start by criticizing the addition of new services with a simulated conversation between Klout and myself. Alex: This brings the total services to 10. Really Klout, you need 10 services? Klout: Of course this will help make your Klout score even better! Alex: But you didn’t do a good job with just Twitter and Facebook, how can I expect you to do a good job with 10? Klout: More data always improves the performance of complicated, black box, machine learning algorithms like our own. Klout: Ummmm, look dude, I’m just a data whore and want to sell your data to the man. Alex: So you just want all of my data to sell it to the man and give me nothing in return? Klout: We actually have a terrific Klout perks program. I see you’ve received two Klout perks. Alex: Yup, you sent me a Rizzoli and Isles gift pack, a TV show on a network I don’t have and literally hadn’t heard of before receiving the gift pack. Did I mention that the gift pack came with handcuff earrings? Klout: But what about your other Klout perk, a party at Rolo, a store in SF that sells jeans. Careful analysis of your Twitter, Facebook, Foursquare and LinkedIn data led us to believe that you like or wear jeans. Alex: Everyone wears jeans. That’s similar to predicting that I like to go on vacation or eat tasty food. These jeans happened to be $175, which doesn’t sound like much of a perk to me. On top of this, android users actually can’t even connect their Klout accounts to Instagram because the app is iPhone only. Ironically, the Klout blog just posted about the average Klout of iPhone and Android users, finding the former beat out the latter 42.0 to 40.6. Perhaps the comparison would be more equal if Android users were allowed to connect 10 services rather than 9? Does MG Siegler actually need more Klout? From Klout’s point of view, I completely understand why they would want to add more services: greater reach, more data, more partners, etc. I suppose they could justify the removal of more specific stats by saying that things could get too crowded on the main page, but then put the data on another page, don’t take it away. Twitter and Facebook still drive the large majority of usage. Do you really think Blogger cares if their stats aren’t on the main page? Seems nefarious to me. After spending two blog posts on the shortcomings of Klout, it only seems fair that I look into the quality of its competitors PeerIndex and Twitter Grader. PeerIndex claims that @feltron should have an audience score of 0, however, the well known data analyst and designer had 11,219 Followers and was listed 907 times at the time of this post. @coachella, the epic music festival in Indio, CA, has an activity score of 0, though the account has tweeted 436 times and several immediately preceding this blog post. Finally, @MummNapaWinery has 0’s across the board even though the account has 312 tweets, 3,122 followers, and is one of my favorite wineries in Napa. I also find it ironic and mildly awkward that PeerIndex gives itself a low authority score and Klout a slightly higher one. In summary, PeerIndex is a legitimate competitor, but they need to fix the user facing bugs I highlighted and really speed up their scoring cycle. If a user shows up to the site and can’t immediately access their score they will have HUGE retention issues. One of the most under appreciated features of Klout, regardless of your feelings concerning the legitimacy of its score, is its infrastructure. The fact that they can ingest the Twitter and Facebook streams, process the data, and update every day is an incredible engineering feat, especially for a startup of its size. Perhaps there is an unseen tradeoff between speed and quality of score within Klout and PeerIndex. Next we consider Twitter Grader. Their approach is totally opaque. The summary simply lists stats that I can get from my own twitter account, a number from 0 to 100, and a relative rank. I have no idea where this rank comes from, especially because there are way more than 9 million people on Twitter. Perhaps this is the number of accounts ever scored on Twitter Grader? I certainly hope not, because that would be incredibly biased. They do provide an article in their help center: How does Twitter Grader Calculate Twitter Rankings. Honestly their score may be great, but I just don’t have enough information and their site is lacking many of the features found in PeerIndex and Klout. Paul Graham, @paulg – the fearless leader of Y Combinator. Welcome to my site! I currently work at Chomp on the research team. Check out my blog posts on the left, browse topic pages from the menu, or see my social media pages using the icons above!